"This is homemade right from the pumpkin and truly delicious." Mix brown sugar, ground ginger, salt, cinnamon, nutmeg, allspice, and cloves together in a large bowl; add pumpkin and eggs. Beat the pumpkin mixture until smooth. 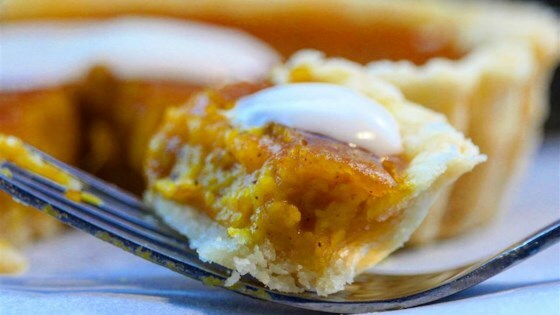 Stir evaporated milk into the pumpkin mixture; pour into the pie crust. Bake in preheated oven until the pie is set in the middle, 35 to 40 minutes. Cool to room temperature before serving. To mash your own pumpkin, cut it in half, scoop out the guts, and then cut it in half again (into quarters). Bake at 350 degrees F skin side down for about an hour. Remove the skin and mash the pumpkin.